Ohio-based Jody Casella has been writing stories since the age of seven. She majored in creative writing at Rhodes College and has an MA in English from the University of Memphis. 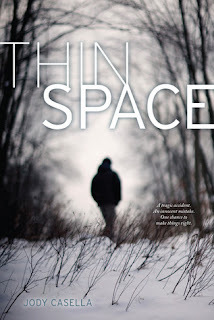 After many years teaching and raising children, she's thrilled to be making her debut with THIN SPACE (Beyond Words; Simon & Schuster), a paranormal YA mystery about a boy coming to terms with his twin brother's death. I've read a lot of great reviews about this book, and it looks like it would be a great addition to my high school library. The thing I love most about this book is the cover. The cover is one of the things that helps me decide if I want to look inside. This one draws me in and makes me very interested. I really like the storyline, and would love to read more about this Thin Space. It sounds like an exciting read. Thank for having the giveaway. The supernatural aspect has me intrigued.